How does tape storage help to solve the dual challenges of growing storage capacity demand and budgetary constraints? This session discusses the economics of tape storage and how you can realize return on investment from your tape storage initiatives. Object storage has been talked about for years, but interest is finally picking up steam as object vendors meet the traditional storage and file system vendors “half way” by simplifying roll out and integration with the file and block storage universe. Join this IT-SENSE Brown Bag webinar for an update on the state of object storage by editor Jon Toigo and an interview with a Adrian Herrera, Vice President at Caringo, maker of SWARM, a leading object storage technology. If you are thinking about object storage technology, you do not want to miss this lunch time webinar. In this Brown Bag webinar, IT-SENSE.org editor Jon Toigo will survey the current capabilities and limitations of infrastructure management technology. He will identify the challenges to effective management that are appearing in virtualized server and storage environments and will suggest several criteria for use in selecting the right management products for deployment into contemporary data centers. Toigo’s talk will be followed by a Between Two LUNs interview with Nikki Jennings, Group Vice President, Products, SolarWinds, a thought leader in the integrated infrastructure management field. Jennings will discuss the challenges confronting IT managers who are working to pull together whatever management protocols and element management utilities that are available on hardware to create some sort of unified management solution. He will explain how SolarWinds has managed to assemble some of the most advanced tools for server, network and storage management into a suite of integrated modules leveraging a common graphical user interface and back end database. The final 15 minutes will provide attendees the opportunity to ask questions of both Toigo and Jennings as a precursor to beginning their own journey toward a well-managed infrastructure. With software-defined storage taking hold both as a model for building data storage infrastructure behind servers and as a template for designing ready-made hyper-converged server/storage hardware nodes, IT planners confront many options for creating a high performance, cost efficient platform for data hosting. Just as important, however, is the design of storage infrastructure for high availability – to protect against hardware and software glitches – and for survivability – to ensure data accessibility in the face of disasters with a broader geographical footprint. 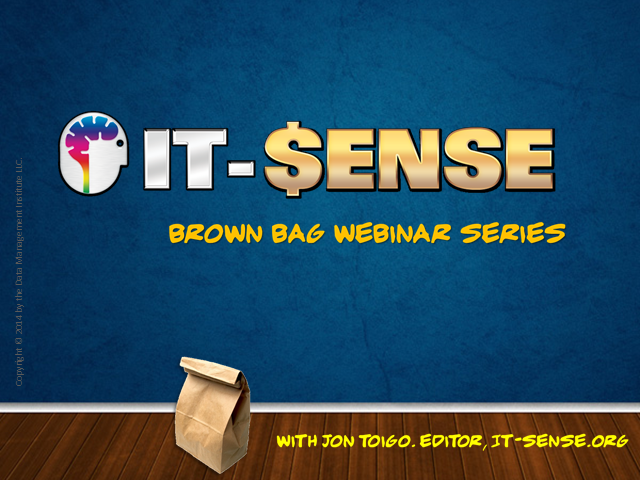 In this Brown Bag webinar, IT-SENSE editor and chief Jon Toigo kicks things off with a discussion of the requirements for building a bullet proof storage infrastructure using software-defined and hyper-converged elements. He will be joined in the Between Two LUNs segment by storage expert Max Kolomyeytsev from StarWind Software to talk about the availability/survivability of StarWind technology and the resiliency of its latest hyper-converged infrastructure product, developed in connection with xByte Technologies. For the past 18 months, the technology trade press has been filled with articles by vendors and analysts proclaiming the emergence of an entirely new conceptualization of storage infrastructure: software defined storage. In this webinar, IT-SENSE editor, Jon Toigo, looks at the realities of virtual SANs from leading hypervisor vendors – their capabilities and limitations – and how they may be missing the storage requirements of smaller firms and companies that need to support remote and branch offices. Joining Toigo will be Anatoly Vilchinsky, Head of Support for StarWind Software, an early mind share leader in virtual SAN technology. Agile has become the buzzword for the contemporary corporate IT vision. Agile vendors argue that high availability is baked into their latest technologies and architecture, reducing requirements for disaster recovery and business continuity planning going forward. This Brown Bag Webinar, hosted by IT-SENSE.org editor, Jon Toigo, evaluates that claim by examining the veracity of the underlying assumptions and setting forth an outline of the requirements for achieving the levels of operational continuity that are the foundation of truly agile data center services. Toigo walks us through the myths of agile high availability and the requirements for business-savvy business continuity in the modern mainframe data center. Then, in the Between Two LUNs segment, Toigo interviews Rebecca Levesque, CEO of 21st Century Software, a mainframe continuity evangelist whose company provides the tools to deliver a dependable disaster recovery capability in the dynamic mainframe data center. Finishing out the session will be a Q&A period in which your questions for Toigo and Levesque will be fielded and resolved. Tape can deliver many potential benefits including storage cost savings and capacity right-sizing. This session provides tips from the trenches for implementing tape storage strategies successfully. In most businesses data storage in an unorganized junk drawer. Needed is a simple and straightforward method for archiving files that must be retained but are seldom accessed or modified. Here's how. Webinar programming for online e-zine, IT-Sense.org.